These pillows are the bees knees!! Cool and airy, with the perfect amount of support. So good I’m ordering another set, probably two, tomorrow. This superior quality pillow provides the softness of down and comfortable support for back and stomach sleepers alike. 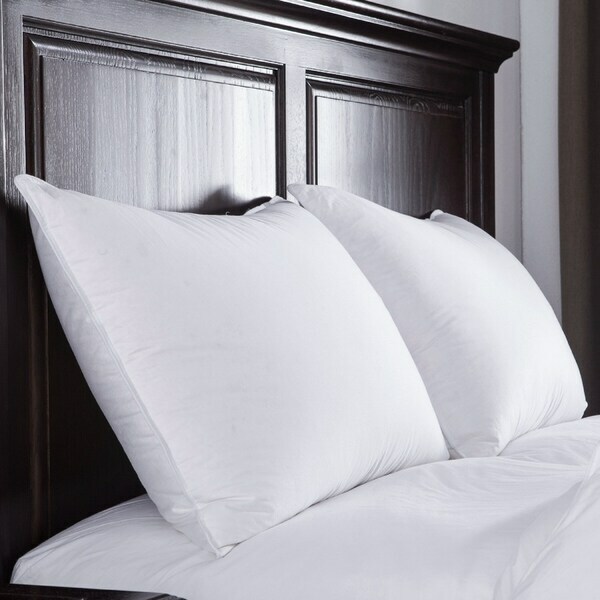 Luxurious 400 thread count 100% cotton sateen cover is the perfect addition to your great nights sleep. Pillows are made from 400 Thread Count 100% Cotton sateen. Filled with 75% White Goose Down, 25% White Goose Feather. Spot Clean, Dry Clean Reccomended Materials are Responsible Down Standard certified and cleansed by Oxipower technology. Dimensions 20.0 In. X 28.0 In. X 3.0 In. Down Pillow Fact Sheet from Overstock.com. Our guides provide customers with facts about down pillows. How to Choose a Down Pillow from Overstock.com. Our guides provide customers with information about how to choose a down pillow.